One night in Nice is not nearly enough! 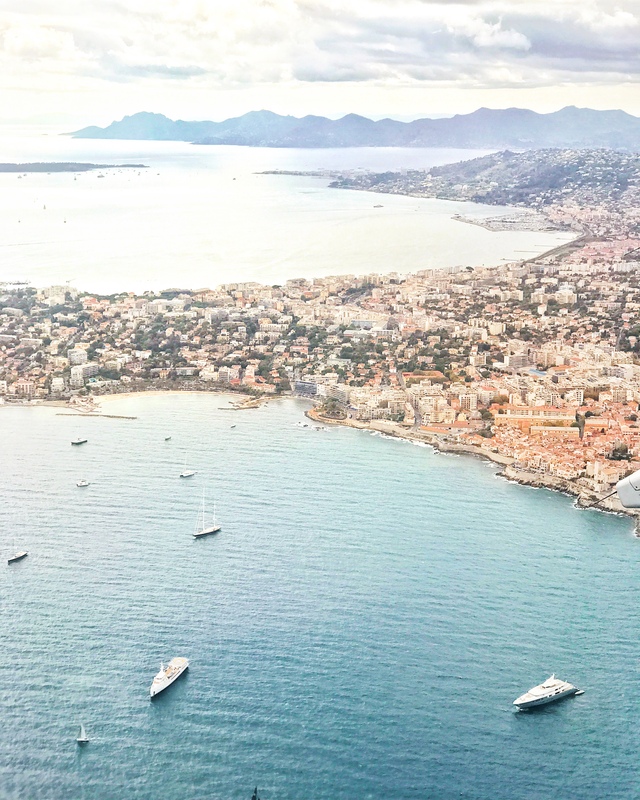 We had a gorgeous and magical vacation from our vacation (read: time to relax and take it slow without packing our days full of activities) when we made it to the gorgeous south of France on our way from Paris to Rome. 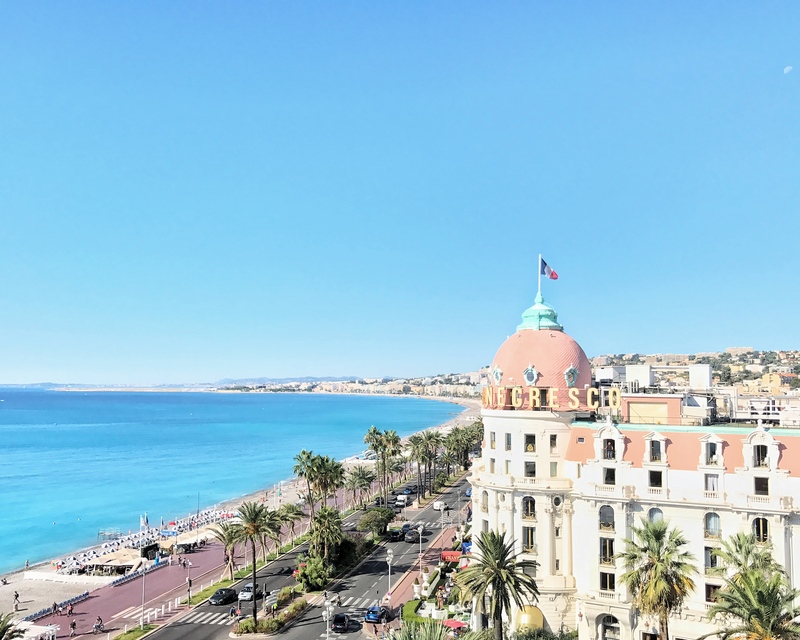 Nice is absolutely spectacular; it’s Europe meets the Caribbean and feels ever so slightly like San Diego. From the breathtaking views to the fantastic food and impeccable weather, we were left wanting many more days in this little piece of paradise. Here were the highlights from our very brief stop on our Eurotrip. We flew from ORY to NCE, and took a short cab ride into town. The Nice airport is small, clean, organized, and nice (as far as our experience went). They have a fantastic duty-free section where you can get local (and amazing) rosé (more on that later), and a treasure trove of other French products. We flew Air France, which is hands down one of the best airline experiences I’ve had to date. 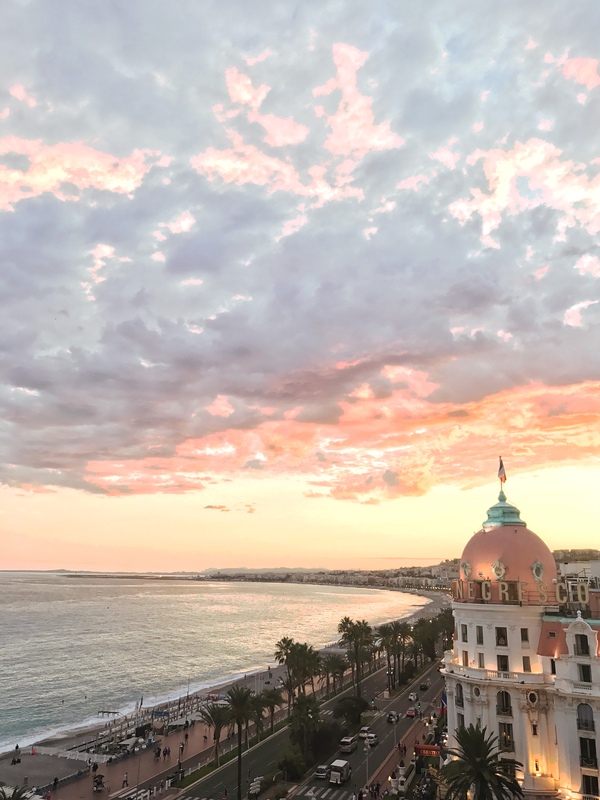 For arguably the best view in Nice — including the iconic skyline with Le Negresco hotel’s peach dome roof — get a sea-view room at the Hotel West End. Yes, Le Negresco is iconic and swanky, but I honestly think the view *of* the hotel is more exciting. 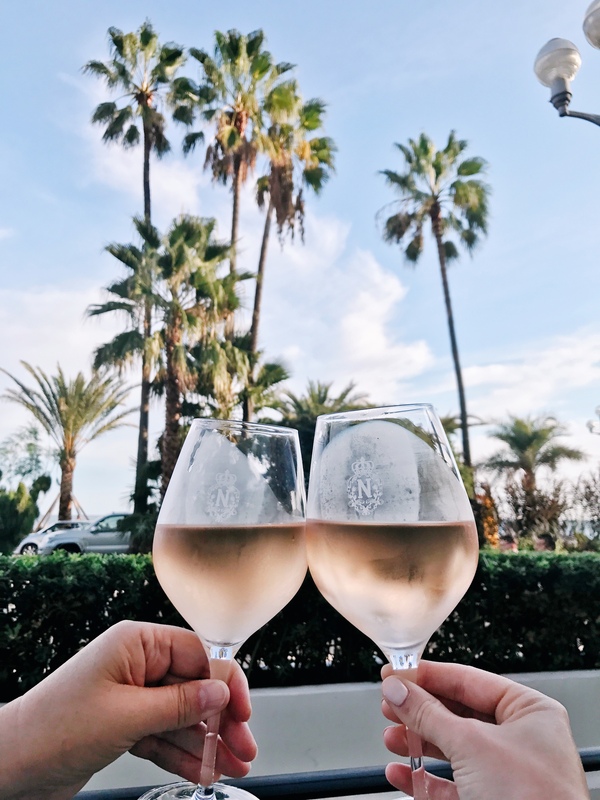 Grab a cold bottle of wine and watch the sunset on the balcony, and order room service to eat breakfast from your outdoor table while watching the sun come up over the crystal blue water in your hotel robe. It’s seriously magic (and also cheaper than Le Negresco!). We ate dinner at the hotel’s restaurant downstairs, Le Siecle. With an oceanfront view of the Mediterranean, great service, and a lovely seasonal menu, we were delighted with our experience. Definitely worth a visit, especially if you’re staying at the hotel! Breakfast is included in your stay, but if you’d prefer room service, it’s only an 8 euro charge to have it all brought up so you can enjoy a pain au chocolate and cappuccino on the balcony overlooking the ocean. Highly recommend this option — one of the most delightful activities you can experience. 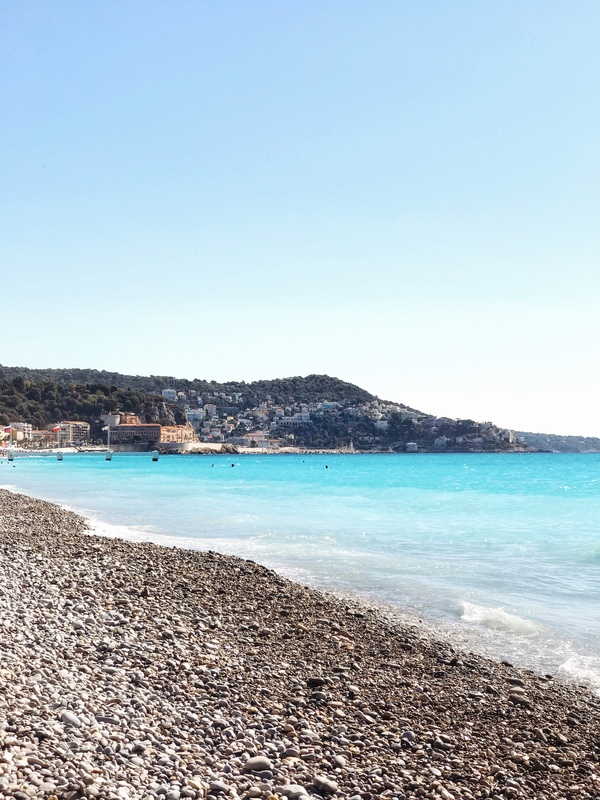 We couldn’t go to Nice and not go in the water — at least up to our knees! The beach there, as you may know, is not soft sand — it’s very rocky (similar to Trestles in California), and thus pretty uncomfortable for bare feet. But the water is warm, crystal clear, and lovely. Avoid the rockiness and take advantage of the crystal blue waters by using the hotel’s 20 euro package — you’ll get a chair, a mat, an umbrella, and access over the rocks (strips of walk ways and a little dock and ladder that allows you to jump into the water). So I found my favorite rosé of all time, in one of the most dreamy moments of our entire vacation. Once we checked into Hotel West End, we popped over to Le Negresco’s Le Chantecler outdoor terrace where we relaxed in the late afternoon 70º weather seaside by the Mediterranean; the sea breeze was just barely rustling the palm tree leaves and French flags while we breathed in the salty air. We ordered the Chateau Minuty “Rose et Or,” and were treated to exceptionally generous pours of crisp, cold blush wine. I’m not a wine person, I *don’t* like 99% of the wine I try, and I was smitten with this variety. Super smooth, delicate, dry, and silky. In fact, we both loved it so much, we bought a bottle in the NCE airport on the way to Rome. Aaaand we went back the next day for another glass on the terrace. A friend of mine who grew up in Nice suggested we get the local street food staple: Pan Bagnat. We wandered into the town’s marketplace to get this delicious Niçoise salad on a hearty French roll – so delicious, highly recommend! The fish was SO fresh as was the rest of the produce used in this salad sandwich. Of course, we also got a little lemon tartlette for a sweet treat. Next time I’ll make sure I have more than 24 hours to spend in this beautiful place, but for now, I’m feeling really good about our little sampler platter of Nice activities. And until then… I’ll be dreaming of that Chateau Minuty.